It's time again for Secret Recipe Club reveal! My secret blog assignment this month was Bewitching Kitchen written by the lovely Sally. While she grew up in Brazil and has lived in some exotic places like Paris, she's now settled in the middle of Kansas where she and her husband both work in the Biochemistry Department of Kansas State University. Sally, along with several other bloggers, was recently featured on the Secret Recipe Club blog as a Gold Member. She is kind of infamous in the Secret Recipe Club, where she and her 'friend' Dorothy are constantly competing with one another to see who can find the perfect recipe, shop for, cook, photograph, and write her blog post first every month when they get their SRC assignments. It's always fun to see their comments. Unlike Sally, I do not choose a recipe quickly. This month I get to blame it all on her! So many amazing-looking, mouthwatering recipes! If you have not checked Bewitching Kitchen out, you simply must! Sally has only recently joined Group A, so this is my first time browsing through her blog, but I can assure you, it will not be the last. Not by a long shot! The first recipe that caught my eye was for these Quinoa and Sweet Potato Cakes, but then I noticed they were a previous SRC post so I had to continue looking. I'm pretty sure I'm going to be making some of these soon, just not for this post. 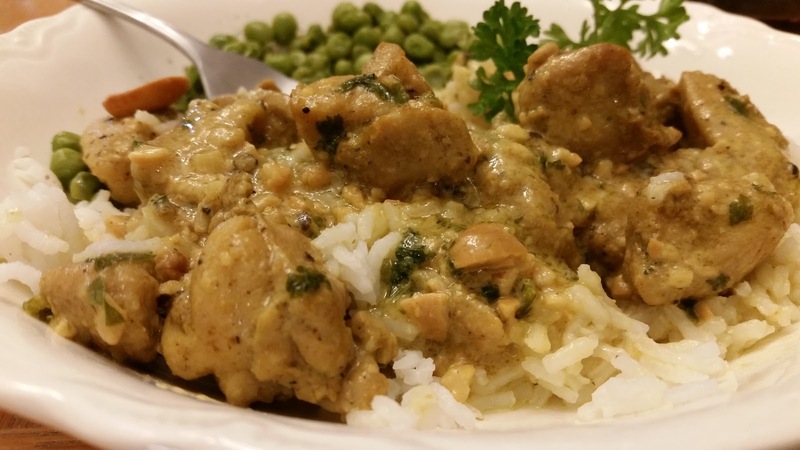 Black Pepper Chicken Curry - I think this is it! Indonesian Ginger Chicken - oh man, I can't stop! 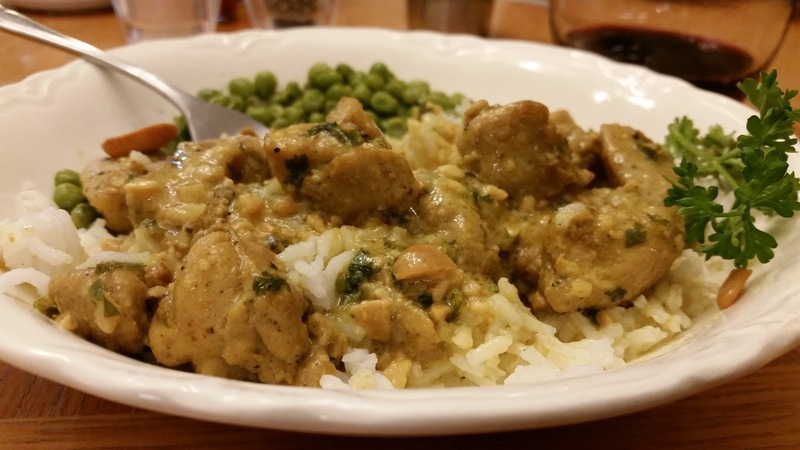 In the end, I did go with the Black Pepper Chicken Curry, and I'm so glad I did. It was wonderful! Meanwhile, place 1/4 cup of cashews in a small food processor and process, not too fine. Reserve. In a large deep nonstick skillet, heat the remaining 2 T of oil. Add the diced shallot and saute for a few minutes, until translucent. Add the chicken, ginger, Serrano chile and the remaining 3/4 teaspoon of salt and cook, stirring occasionally, until the chicken is golden, about 8 minutes. No need to cook through. Stir in 1/4 cup of the coconut milk, the water, and the processed cashews, Cover the pan and simmer until cooked to your liking (about 30 minutes). Add the remaining 1/4 cup of coconut milk, the lemon juice and the fresh parsley to the chicken and simmer, stirring. Serve with rice and the rest of the cashews. The only thing we wanted was more of the yummy sauce to go with our chicken. The flavors are absolutely amazing. Sally cooks hers in a pressure cooker, and it looks a bit juicier, so I'm either going to have to start using a pressure cooker - though I'm a bit scared of the whole thing - or perhaps use a bit more coconut milk and water to get more sauce. Because, of course, I am going to be making this one again.